FRANK WILLIAM COOPER CANFIELD – Frank William Cooper, 93, died peacefully at home on Jan. 10, 2013, with his loving wife of 65 years by his side. Frank was born June 12, 1919, in Stamford, Conn., a son of the late Frank W. Cooper and Maria (Picciano) Cooper. He was a 1935 graduate of Stamford High School and a 1939 graduate of the New Haven Institute of Technology with a degree in Electrical Engineering. He served his country as a communications officer aboard a ship in the U.S. Navy during World War II. Upon his return from the war, Frank took a position with Cutex in Omaha, Neb. as an engineer. He hired Lotis J. Storjohn as his secretary, whom he later married on Sept. 21, 1947 at her family’s cattle ranch in O’Neill, Neb. Their three children were born in Omaha, and shortly after, career opportunities led them to the East coast. They eventually settled in Pittsburgh, where Frank was appointed president of FESCO, a plastics manufacturing company. He led FESCO for two decades and was considered an innovator in the emerging plastics industry. 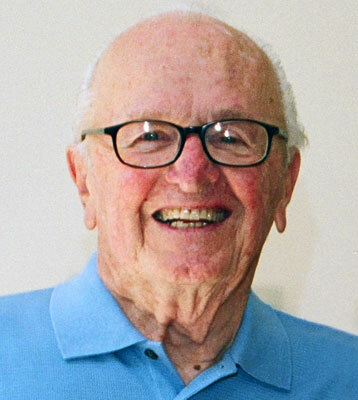 Following his retirement from FESCO, Frank and Lotis moved to his home state of Connecticut, where they lived for several years before settling in Canfield in 1993. Frank was a man of many passions, including amateur (ham) radio, music, and flying. As a young boy, his brother-in-law introduced him to ham radio, which became a lifelong hobby. He received his novice license at the age of eight, and over the years he won numerous DXpedition awards. Frank and his call letters, W3NV, are renowned throughout the ham radio community. He prided himself in having made contact with every country in the world. In the past month, he was thrilled to have worked the new Republic of South Sudan. Amateur radio offered Frank the opportunity to make enduring friends all over the world. He also greatly enjoyed mentoring young ham radio operators. Music held a special place in Frank''s life. He began studying violin as a child, and developed a great love of classical music. A childhood trip to the Metropolitan Opera sparked a passion for opera that lasted his entire life. He was most recently excited about having attended Rigoletto at the Benedum Center in Pittsburgh. Frank was an accomplished pilot, another interest he acquired as a youth and cultivated throughout his life. He taught flying in Dayton after the war. While living in Pittsburgh, he owned two airplanes which he kept at the Butler County Airport. As a member of the AOPA, he always strove for the highest level of achievement and received his instrument rating. The greatest of all his passions was his wife, Lotis. They shared over six decades of life’s experiences and joys together, and Frank always put her well-being first and foremost. Those who knew Frank will remember his love for his family, his enthusiasm for life and learning, and his gift for connecting with everyone he met. Children in particular were captivated by his energetic personality, and he enjoyed a special relationship with each of his eight grandchildren. In addition to his wife, Frank is survived by his son, John W. Cooper (Gena) of Cedaredge Colo.; two daughters, Dr. Linda J. Cooper (Rodney J. Lamberson) of Canfield and Cheryl M. Cooper of New York, New York; his sister, Mary J. Beardsley of Austintown; and eight grandchildren, Zachary Cooper, Vanessa Page, Dr. Vita Lamberson (Michael Mathes), Christopher Cooper, Zoe Lamberson, Lauren Page, Eli Lamberson and Eva Lamberson. Frank was preceded in death by five sisters and a brother. Friends may call on Tuesday, Jan. 15, from 4 to 7 p.m. at the Higgins-Reardon Funeral Homes, Canfield Chapel. Funeral services will be held Wednesday, Jan. 16, at 11 a.m. at the Higgins-Reardon Funeral Home, Canfield Chapel. A private interment will follow at Green Haven Memorial Gardens. The family requests that gifts and donations be made to the American Radio Relay League (ARRL) Foundation at 225 Main St., Newington, CT 06111-1494, http://www.arrl.org/memorial-gifts, or to Opera Western Reserve, 1000 Fifth Ave., Youngstown, OH 44504-1672, http://www.operawesternreserve.org/. Friends may visit www.higgins-reardon.com to view this obituary, sign the guest book, and send e-mail condolences.